Mobile are becoming more and more important in the lives of employees. Indeed, they check their emails, documents, instants messages and many others. Teams application allows you to stay connected with your teams thanks your mobile. 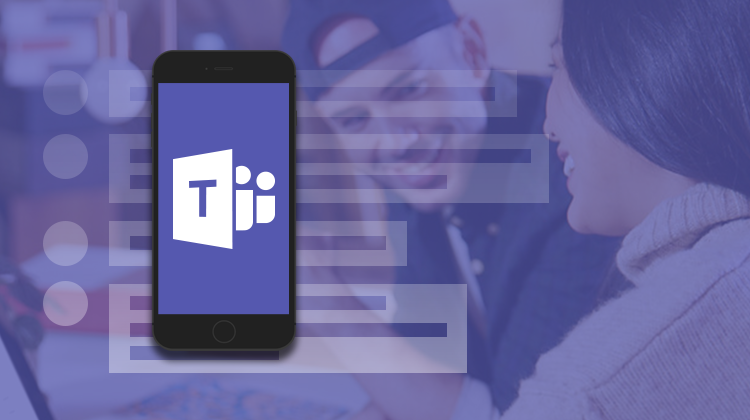 To download your Teams application, go to the Apple Store or Google Play Store according on your mobile phone and research for “Microsoft Teams”. When your application is installed, enter your ID. You will find all the teams you belong to when you are logged to Microsoft Teams on your computer. Set up your notifications to receive them directly on your mobile. How to use it on a daily basis? Our use case scenario shows you how a project manager can manage different situations when he is out of the office. For example, he may have to make a change in a project or in his teams. It’s important to be able to deal with this type of situation. To manage this new situation while being out of the office, the Teams application is the perfect tool! First, add this new member in the project’s team. To do this, you must go on the “Teams” tab and select the project concerned. Only the group owner can add members to his team. It is possible to have several owners in a single team. Then, select the ellipsis and click on “Add Members”. In this way, the employee will be able to join this group and view the history of the various discussions and shared documents on this topic. Discussion channels can be organized by topic, location, project or discipline. By default, a “General” channel is automatically created with the team. To add a new one, simply click on ellipsis of your workgroup, display “View Channels” and press on the “+”. Then add an explicit name to the channel as well as a brief description to help users understand the main topic for the discussion channel and validate on the top. In a second step, it is possible to modify a document. To do this, select the relevant channel and then in the tabs, click on the document to open it. The document can then be modified. To conclude, when you are in an emergency, you will be able to react very quickly and keep track of your teams work even when you are out of the office. The Teams application allows you to easily access your work environment. Would you like to draw attention of one of employee? Mention him in your conversation! To do this, just add “@” in front of his name when you write your message. Want to know more about it? Find our course with the associated use case scenarios and our tutorials: Teams – Using Teams on iOS.